This charming picture book is a story about a boy nicknamed Sparky and his beloved dog, Spike. Spike is the most amazing dog ever. He inspires Sparky to draw. Someday, Sparky will be an artist. Based on the childhood of Charles Schulz, creator of the world-renowned Peanuts comic, and the dog who inspired the most beloved dog of all—Snoopy—this Junior Library Guild Selection will resonate with children everywhere. 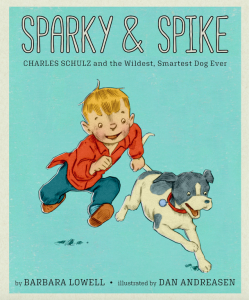 Sparky & Spike includes a biographical note, as well as archival photographs of Sparky and Spike and a letter Charles Schulz wrote to the book’s illustrator, Dan Andreasen, when Andreasen was a boy.